Our first stop in Sri Lanka was a city called Negombo. Only 16km from the airport, Negombo is a two part city: town and beach. We opted for beach: clearly. At the bus stop we paid less than a dollar to catch a Tuk Tuk to a guesthouse at Negombo Beach. The beach was beautiful! White sand, palm trees, warm water: it was paradise. There were little fishing boats with huge sails scattered across the horizon and locals and tourists swimming in the waves (in bathing suits might I add. Completely opposite to India). We headed immediately to the beach to lie out on the sand as relax in the late sunshine. We’d been in the country only a couple hours and I was already in love. The guesthouse we stayed at was called Marshall’s Beach Guesthouse. Marshall, the owner, was so lovely. He was also a tour guide around Sri Lanka, so he had a million suggestions on places to visit and stay for the night. When I asked him about guesthouse recommendations for Anuradhapura, he gladly flipped open a huge binder with guesthouse business cards all in alphabetical order according to city. So helpful. But although Marshall himself could not have been any nicer, the man that ran the guesthouse when Marshall was away wins as my favourite person in Sri Lanka. Although his English wasn’t perfect, his hospitality and his constant concern about our happiness made him the sweetest person we had met in ages! “You happy?” He would ask us with a huge grin. “You happy then I am VERY happy!” He would genuinely ask us this after every meal, or showing us our room, or after we’d come home from the beach. We wanted to stay forever! 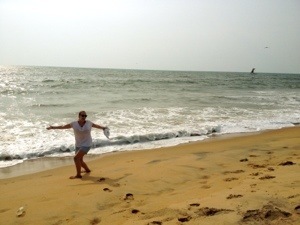 The town of Negombo Beach was small but lovely. It was a single street with a mix of restaurants, souvenir shops and beach guesthouses. All the restaurants served delicious fish curries or traditional Sri Lankan cuisine. Everyone in town wanted to say “Hello” but no one seemed pushy about coming into shops and buying their wares. “Do you hear that?” Asked Kelsi when we were walking down the street. “No, hear what?” I asked. “Exactly.” there were no honking, screeching, deafening car sounds. It was amazing. I don’t understand how two countries, right next to each other can be so different! But I’m not complaining. We wandered the town, relaxed on the beach, and spent a whole lot of time doing nothing. It was great. That night I met an English guy named Max that had been traveling Sri Lanka by motorbike for three months already. By luck, he was able to offer us the best places to see in Sri Lanka. With his suggestions, we tweaked our original plan and had an epic 5 days ahead of us. Next stop: the ancient ruins of Anuradhapura! 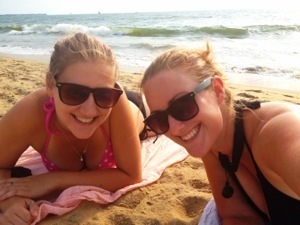 This entry was posted in Asia, Sri Lanka and tagged Beaches, Marshall's guesthouse, relaxing by hilarylust. Bookmark the permalink.